It is no secret that I’ve struggled over the past couple of months. I stopped running, I stopped exercising, and I gave into a heavy addiction of food. But, as most of y’all know, I’ve been working hard to take baby steps to progress. And I’ve been doing good. In the past, I wanted to change everything at once. Go all out, go hard or go home. But through intensive therapy sessions, we have slowly focused on making minor changes and getting used to them and then adding in other changes and repeating the process. Self improvement takes lots of time and learning to do things slowly and not get burnt out has been a tough pill to swallow. Two finals stand between me and my college graduation and I’m finally in a place where I am confident and feel good. Sure, I do look in the mirror sometimes and am not completely satisfied with the way my body looks, but I keep my head tall and am proud of where I’m at. Since school is winding down and I have time to breathe, I’ve been focused on finding my groove again. I made mention in an earlier post that I am looking to back off the half distance and focus more on 5ks. But starting over is no fun. I’ve spent a lot of time outside this week working on getting my legs and heart stronger. Monday I did a three mile walk with running intervals mixed in. I recorded the time that I actually spent running and unbelievably was able to hit 22 minutes of running. Mind you, it was not a consecutive 22 minutes and 6 minutes was the longest I ran without stopping but 22 minutes is a start. After running I went to the gym and spent about 20 minutes doing dumbbell and bar bell exercises. When I got home, Momma came outside and we did a few tire drills. 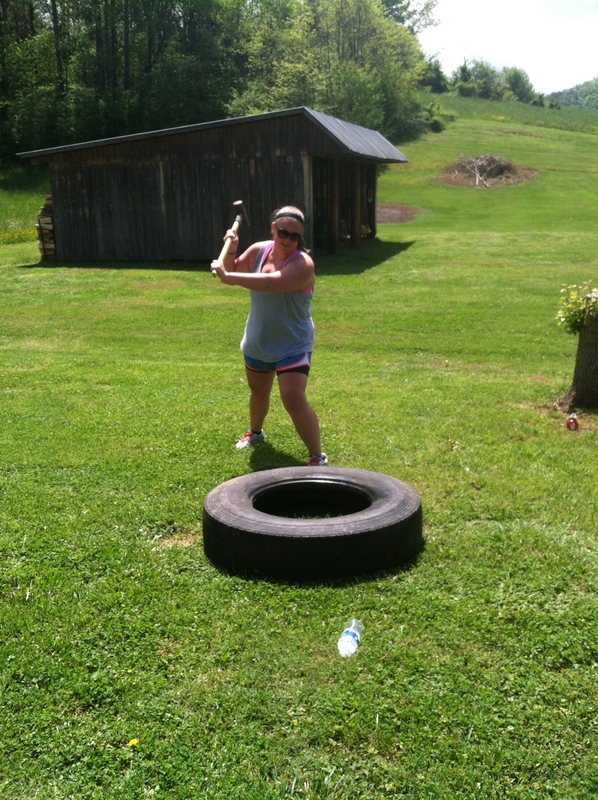 We took turns flipping the tire across the yard and then got a sledgehammer and beat that tire hard. Needless to say I was sore the next morning. Tuesday was the same thing: a 3 mile walk with bouts of running. I was only able to run for 15 minutes on Tuesday but was still stoked. When Momma got off work that day we went for another 3 mile walk. Wednesday was a fairly busy day for me but I was able to go on an evening walk of three miles. Can you tell that I love walking three miles? Thursday morning, I met Momma after my final for yet another three mile walk. It was ridiculously muggy outside but at least it wasn’t terribly hot. After our walk, I had to make a cake for a local bake sale and ended up licking the spoon and bowl. I ended up feeling guilty about this so I hit the greenway for one more three mile walk to sort of offset the dang cake batter and I sure did feel better. Tomorrow I have a 5k. I haven’t signed up yet because there are two I have my eye on and can’t quite decide which one to actually do. It won’t be a PR by any means, but I’m hoping to at least set a PR since I’ve been “back”. My goal is to walk down my time from New Year’s Day (37:24) and consistently get faster each race I do. By December I would like to be back in PR shape. I had only been consistently training for four months when I took my 5k time from 39:53 to 28:36. We’ll see if I can at least get a 35:48 which would beat my time from January’s Race Against Racism. If I don’t hit it, I won’t be mad. I’m just getting back into adding running into my walking. This stuff takes time, don’t it? Hope everyone has a good weekend and thanks for being so kind as I work to find my groove! 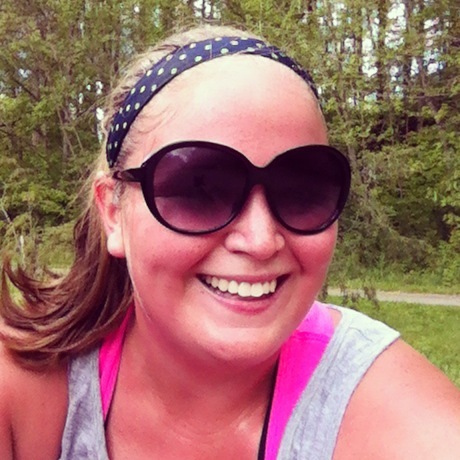 This entry was posted in Workouts and tagged 5k, fat girl runs, finding yourself, running, tire flipping, walking, working hard by thegogirlblog. Bookmark the permalink. Yay! it’s great that you and your mom can spend time this way! and Great job of starting to run again! I FINALLY went back to the gym yesterday and I felt great afterwards. Yay us! High five buddy! Fantastic attitude!!! It is so easy to beat our self up when we return (or not return at all!) from working out! It sure does take time. You have such a great perspective on this. And I love that you are so self-aware. You know that you need patience with all of this, and you know that the patience is sometimes difficult. I love reading your blog because you are so REAL. Keep it up!